EverDry Waterproofing has been named a “Top Workplace” by Cincinnati.com. The Top Workplaces program recognizes local companies with outstanding workplaces. 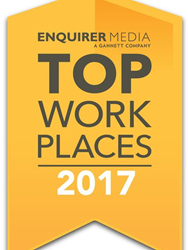 Companies included in the program receive recognition in a special edition of The Cincinnati Enquirer, an online profile at topworkplaces.com, and the ability to use the Top Workplaces logo on company websites and materials. EverDry Waterproofing of Cincinnati is the area’s leading and largest basement waterproofing and foundation repair contractor and has served Greater Cincinnati, Northern Kentucky, Dayton, and Southeast Indiana since 1985. The company has set itself apart from others with its strong dedication to clients, including a lifetime warranty on services that can even be transferred to future owners. The team at EverDry Waterproofing of Cincinnati is excited to now be recognized as an area-leading workplace. “You will be working with good people,” said another employee when asked about the atmosphere at EverDry Waterproofing. The team at EverDry Waterproofing is dedicated to its clients as well as to its employees and is excited to be included in the Top Workplaces program. More information about the company, its services, and history can be found at http://everdrycincy.com/. EverDry Waterproofing is the premier basement waterproofing and foundation repair contractor serving Greater Cincinnati, Northern Kentucky, Dayton, and Southeast Indiana since 1985. The company’s staff is dedicated to delivering friendly, professional services each and every time backed by unparalleled value.